2. The ability to add "abstract" also as the quote. 5. In the editing of style, when you create a new component and you want to rename it, the cursor after each letter goes to the first position (see attached file). Hello and thanks for your input! I added this to our internal wishlist. ability to add "abstract" also as the quote. An entry in our wishlist has already been made. We have to examine this. That is a difficult problem and we have discussed the necessary features in the past. Some nice ideas are waiting for realization. I'm sorry. We are not planning to add a Maxthon Picker. In the editing of style, when you create a new component and you want to rename it, the cursor after each letter goes to the first position (see attached file). This bug will be fixed with the next update. It Is not necessary yet - I found this ability in program. 10. Is there possibility of "batch modify" for types of references? We have an alternative approach for splitting up an reference entry into different Citavi fields, but haven't found the time to realize the idea yet. Added in toto to wishlist. 9. the references and quotes to be stored in one comon base, which could synchronize with each project. Allready on our todo list. First, create a selection. Do a right click on one of the references in the selection and use the command Batch modify to assign categories, apply keywords, or add tasks. You may also change the type of reference for all selected references at once. In Citavi 4 you will be able to do Search/Replace-Operations. It is not working - I select several references and, and when I'm changing the type, is changed only in one reference. In "batch modify" there is not possibility to change type. 11. Picker for Foxit Reader PDF (it is more convenient than Adobe Reader). Concerning bath modifying the document type: Have you followed the steps shown in this video? Concerning Foxit: I'm sorry to tell you that we are not planning to add a Foxit Picker. Oh! Thank you very mutch - I did't see this menu. 12. 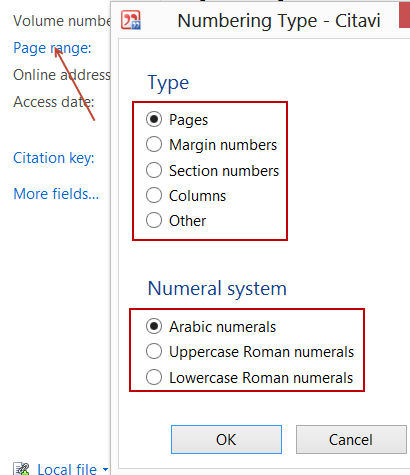 Similarly, as the page number, add another field for the paragraphs or sections of books, which then will be inserted in the references with page numbers. This is already on our wish list.